Welcome to the CPHS Website! We, former students and teachers of CPHS, have been striving over the years to keep our memories of the good times and good friends we made during our short time at CPHS alive and well. This website is sponsored by the College Park High School 1943-1975 Reunion Committee to make contact and coordination easier, and hopefuly to find lost friends and classmates. We welcome any news about people or events relating to CPHS, and will be happy to present it here. If you have any news or messages, announcements of individual reunions, or anything else you'd like posted, please email us at GeorgiaCPHS@gmail.com, and we will put it under "class news." The more active you are, the better the site will be!!! In 1927, before CPHS was on Main Street, it was on the east side between Hawthorne and Temple. The building was later used as S.R. Young Elementary School. 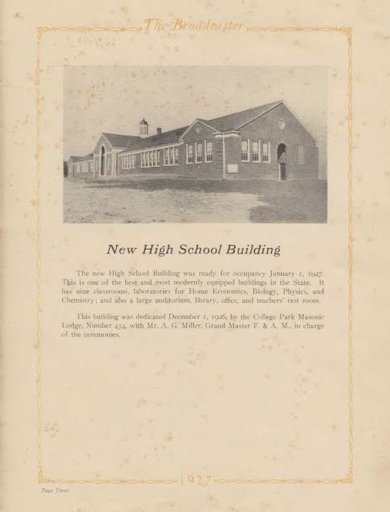 This information and photo are courtesy of Steve Willingham (Class of 1967) from the 1927 CPHS yearbook "Broadcaster." Thanks, Steve!! If you have changed your email address since registering (or if you never check it and your box is full), it's quite possible you will not receive email announcements from us. Please take a moment to log into your account and make sure the email address you log in with is a good one. If you can't remember your login and/or password, just let us know and we'll fix you right up!! Email georgiacphs@gmail.com. We have been receiving quite a few bouncebacks and if one of them is yours, you may be missing out!! 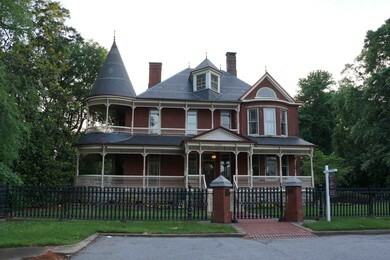 At our reunion, lots of "stories" were shared including those about the CPHS campus and what will become of it, along with stories about other "noteworthy" structures in College Park, some no longer there (The Tennessee Corp office on HWY 29 adjacent to Newton Estates) as well as the grand Victorian brick home that still sits on property adjoining College Park High School. Upon returning home to Hilton Head Island, I came across a handout for "Annabelle", also known as "Palmour House," which I received at an open house some years ago after the property had been restored by the Stokes & Murphy Law Firm. Brian Marsh sent us the handout, which I found fantastically interesting. If you'd like to see it, click here. To see photos from the reunion, click here. First-Time User or Haven't Set Up Your Profile Yet?? There are a lot more options available to registered users on our site, so if you haven't registered and created your profile yet, you'll probably want to! Names of classmates from most years have already been added because we have taken names of seniors from what CPHS yearbooks we have been able to find. So, start by finding your name after clicking "Classmate Profiles." Then click on your class year and find your name. Follow the instructions to create a password and enter your information. None of your personal contact information will be visible to any other classmate unless you check the box allowing it. The Reunion Committee may use your address or email address to send occasional information regarding upcoming events or news. We are happy you found us!! Your former classmates will be happy you found them, too!! 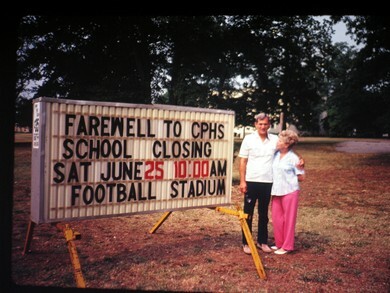 June 25, 1988 was a sad day for College Park, and the thousands of students who passed through the halls of College Park High School. This photo is courtesy of Connie and Dan Harris (Class of 1959). NEED A SCHOOL TRANSCRIPT, CERTIFICATION OF GRADUATION, OR EDUCATION VERIFICATION? In case anyone needs to obtain school transcript information, a certificate of graduation, or education verification, that can be obtained from the Fulton County Records Management Department. Click here for a Records Release Form. For complete information, please visit http://www.fultonschools.org/en/divisions/it/records. If a student is 18 years of age or older, the student must sign the request. Copies may also be picked up at our office with a state/federally issued photo ID. When picking up records on behalf of a former student that is 18 or older, a signed and notarized letter from the student is required. There is no charge for student records/transcripts. Requests are generally processed and mailed the next business day after receipt of request. Once completed by Records Management, the completed verification form will be faxed back to you unless otherwise indicated. WE NEED THE OTHER YEARS' YEARBOOKS!! If you have any senior photos, or have the ability to scan at least the senior photos from any yearbook you may have, please email to us at GeorgiaCPHS@gmail.com, so we can include them here. If you have a yearbook that you could let us borrow to scan and return to you, please contact us.